Women on a Mission: Mom Edition: My Monopoly Photo Book is Here! 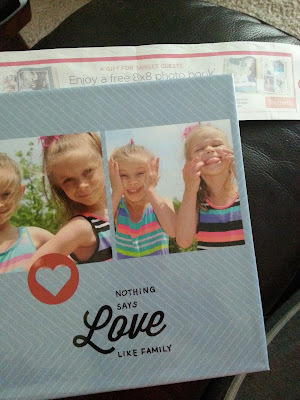 I was waiting for my Shutterfly Photo Book to arrive to do this post – I hoped it would be in time for a Friday post, but nope, you get a Saturday post instead. Well, I wanted to wait till the Photo Book came to tell about it. It was ANOTHER FREE 8x8 Shutterfly album! Shaun got this one from McDonald’s Monopoly, y’all! That makes my 4th free Photo Book using Target catalina coupons, Coke Rewards points and other freebies! The Photo Books are super easy to make. You can load pictures from Facebook, Instagram and your computer. Best of all, while I was waiting for my McDonald’s free album to come in the mail this week, I got a catalina coupon at Target checkout for ANOTHER FREE 8x8 Shutterfly album. What luck! I did contact customer service at Shutterfly and asked – they will extend my coupon expiration date since I just made a Photo Book last week. I might not do that, though, and just make a summer album. Photo Book + new coupon! PS – a lot of these coupons say “for first-time Shutterfly account-holders only” or something similar – but try the codes anyway. I betcha they’ll still work.